The Lumix DC-GH5 Mirrorless Micro Four Thirds Digital Camera from Panasonic provides an outstanding imaging platform for shooters who demand some of the best video and still photography quality they can get in a single compact camera. At the heart of the camera is a 20.3MP Digital Live MOS sensor and a newly developed Venus Engine processor, which both offer dramatically improved processing times over its predecessor. This enables the ability to record 4K video at up to 60 fps, 10-bit 4:2:2 internal recording with select settings, Full HD video at up to 180 fps, 12 fps continuous shooting, and sensitivities up to ISO 25600. Also, the camera features built-in 5-axis sensor stabilization, which can work with certain lenses to activate Dual I.S. 2 for highly effective shake correction that can compensate for up to 5 stops of shutter speed. Helping to achieve the utmost sharpness when photographing handheld, Dual I.S. 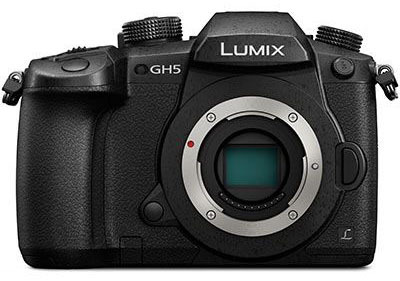 2 combines the GH5's sensor-shift image stabilization technology with lens-based image stabilization to compensate for a broader range of movement types to render sharper, clearer imagery.